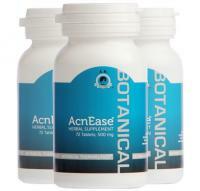 Topical agents treat acne after the pimples have formed, AcnEase prevents pimples from forming. Acne is a follicular inflammatory disorder whose clinical manifestation is pimples, papules and pustules. Its cause is due to overproduction of sebum and blockage of hair follicles. 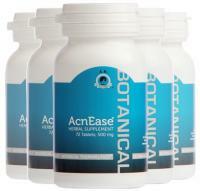 The only alternative oral acne medications are Accutane which has a multitude of safety concerns and oral antibiotics such as tetracycline and minocycline which do not address the cause of acne but rather the bacteria trapped in the excess sebum. Clinicians are questioning the indiscriminate use of antibiotics due to bacterial resistance and the side effects associated with chronic antibiotic therapy. 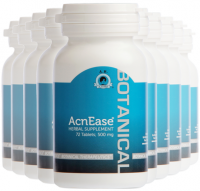 Why you need Oral Acne Remedies? There are numerous causes of acne, the most common however is the over production of sebum by the sebaceous glands. This leads to clogged pores, black heads, white heads, and the growth of bacteria. The etiologic factor however is the overproduction of sebum. Fluctuating hormonal levels stimulate the sebaceous glands to make more sebum, AcnEase interrupts the influence of the hormones on the sebaceous glands thereby preventing pimples from forming. Topical agents do NOT effect sebaceous glands but only target existing acne but do nothing to prevent acne from forming.